Today Apple released the next version of their operating system, OS X 10.8 Mountain Lion. While many herald it as a must-have, the refinements are less revolutionary at the core operating system level, and more focused on integration with iOS-based services. We developers spend much of our time on a laptop or desktop doing research, programming and debugging code, and testing our latest software. Our computers are our lifeblood. They become extensions of ourselves. When something about them changes that hampers our productivity or ability to do work, we get very frustrated. And then we write scathing blog posts and passive-aggressive tweets on Twitter. I recently upgraded from a mid-2008 17" MacBook Pro to a mid-2012 13" MacBook Air. The MacBook Pro I upgraded from was my first Apple machine. I loved Leopard (10.5) and Snow Leopard (10.6) and felt very at home and productive in the 4 years I used them. But the new MacBook Air dropped me right into Lion (10.7). Like many before me, I bemoaned many of the small changes between Snow Leopard and Lion, mostly because many of them decreased my productivity by acting counter to how I'd been accustomed to it, or software I had previously relied on simply didn't work in Lion. This was my lifeblood Apple was messing with here. This is how I make my living. I can't have a computer that I feel is working against me or takes away my ability to work efficiently. Now in the 2 weeks since, I've grown accustomed to a few of Lion's nuances (I've embraced the natural scrolling, for example). But it finally clicked when I saw Apple Q3 financial reports yesterday. In it I finally had statistical evidence to backup the feelings shared in the development community that Apple doesn't prioritize OS X anymore. When Lion was announced, it was unveiled to the mantra of "Back to the Mac", where Apple announced they would be taking some features from iOS and integrating them into their desktops running OS X. What Apple must have seen at the time was that the barrier to entry for Apple into many consumer households was now very low. As low as a FREE subsidized iPhone from a cell phone carrier. No longer were their bold designs and refined hardware relegated to $1000 computers. General consumers could afford a free or $99 iPhone. And they did. They snatched up iPhones in droves helping make iOS the most prolific Apple software ever. 75% of Apple revenue comes from iOS-enabled devices. 75%! Roughly, for every $1 Apple brings in on MacBook or iMac sales, they bring in 5 times as much in iPhone, iPad and iPod sales. 500%! As a company, where would you put your smartest engineers? Probably on the software reaching not only the majority of your customers, but likely the software reaching your first-time customers. iOS-enabled devices have exploded in the last 2 years, and Apple's shift away from developing OS X as its flagship core product have followed suit. 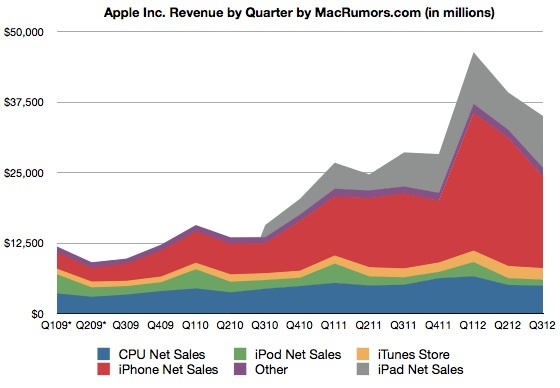 Another graph from MacRumors shows Apple's revenue by financial quarter, where we can see this transition from the start of 2009 to current mid-2012. Pay specific attention to the blue area (OS X devices) compared to essentially everything above it. 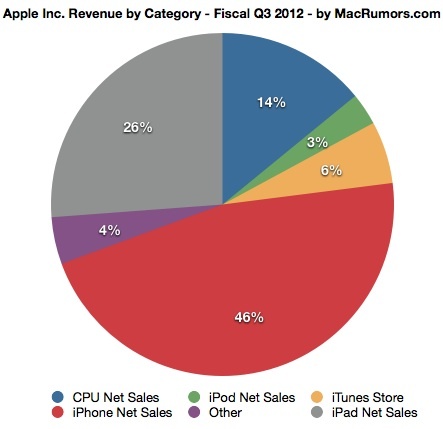 OS X-enabled devices were generating about half as much revenue as iOS-enabled devices in early 2009. But in 3 years since, we've seen a huge shift in where Apple's revenue stream comes from, up to the 500% we saw in the previous graph. We developers should be silly to think Apple's engineering efforts have not followed their products' revenue potential. As developers, iOS is not yet at the point where it can fully replace a desktop-based machine for software development. The majority of developers will continue using powerful desktop and laptop machines to do our programming. Unlike the early days of Apple when the company embraced and found refuge in the hacker mentality, Apple has emerged as a consumer company thanks to the wide reach and accessibility of its iOS products. As hackers and makers we must realize we are no longer Apple's target market. OS X will continue to cater to the lay-consumer to function more like the iOS device they latched onto as a gateway into the Apple product line, all the while giving developers just enough to continue building web platforms and mobile apps that perpetuate Apple's mobile platform.